Each player who registers with 9stacks.com automatically gets a User Balance and a Poker Balance, both initially set to zero. The User Balance is a link between your bank account/ credit cards and 9stacks. 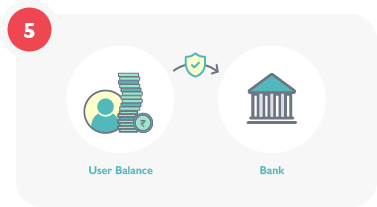 Whenever you deposit money using one of our payment gateways (like PayU or Paytm), an equivalent amount of User Chips are credited to your User Balance. We at 9stacks allow you to freely withdraw these funds at any time. These User Chips haven’t been allocated to poker yet, so in the taxman’s terminology they aren’t yet “in the game”. Therefore, you can cash-out any amount at any time from User Balance into your bank account without any TDS implications. Your game cycle starts when you add chips to your Poker Balance. Poker Balance is what you use to play poker on cash tables and tournaments. If you have any User Chips in your User Balance, you can move some or all of them to your Poker Balance, where they will reflect as the same number of Poker Chips. All the Bonuses at 9stacks are credited directly to your Poker Balance. Once your Poker Balance is loaded with chips, you can use some of those chips to play on cash table or use them to enter tournaments. 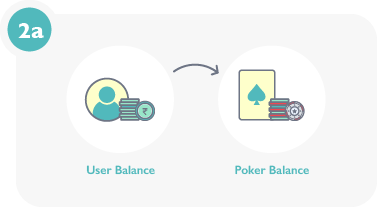 After your game cycle ends, you can withdraw chips from your Poker Balance to your User Balance. You will have to withdraw the full amount (In other words you cannot do partial withdrawals from your Poker Balance). If your winnings (Withdrawal minus cumulative deposit since last withdrawal) exceeds 10,000 or more, TDS is applicable. We will calculate TDS, deduct that from your Poker Balance and deposit it with the tax authorities (and issue you a TDS certificate), and will deposit the remaining amount into your User Balance. Player A2Z deposits Rs 5000 using his credit card. His User Balance now shows 5000 chips. He moves 3000 chips to his Poker Balance. He transfers another 1000 chips from his User Balance to his Poker Balance. He plays at the cash tables with those 1000 Poker Chips and wins 30,000. So, 18,000 (= 24,000 - 6000) will be added to his User Balance. User can cash-out any amount up to 19,000 to his bank account, or move any part of that back to his Poker Balance to play again. You can transfer any amount from User Balance to your Bank account. We promise a 2 hour cash out! User A2Z deposited Rs 10,000 from his credit card to his User Balance. He then transferred this 10,000 to his Poker Balance. 9stacks gave him 2,000 bonus chips in his Poker Balance. Winnings = Final balance - Deposits = 40,000 - 10,000 = 30,000. Note that the 2,000 is not included in “Deposits”. TDS is calculated as 30% of Winnings (=9,000) and the balance 31,000 is credited to his User Balance and is available to be freely withdrawn to the User’s bank account. User has to submit his PAN card against which the TDS deducted during a particular month will be submitted to the government in the first week of the next month. TDS returns are filed within thirty days of the end of every quarter, and TDS certificates will be available to each player subsequently. 9stacks is only deducting TDS at the rates mandated in section 194b. Each user remains responsible for calculating his or her total tax liability for winnings on 9stacks.com as well as other poker sites (and, indeed, his or her other income!). We recommend you get professional advice in this regard.